We're looking for your ideas! Do you have a question about fire safety programming or would you like to share an event or program with other educators and firefighters from across the country? If so, we want to hear from YOU! Click on the Fire Department Participation Form link below to participate. Host Dayna Hilton joined the fire service in August 2000. 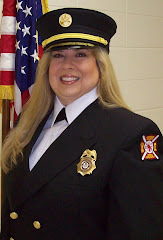 As a second generation firefighter, she is the owner of Firehouse Dog Publishing, LLC™ and the author of the children's fire safety book and audio book, Sparkles the Fire Safety Dog. Hilton is the host of askafirefighter.net, firesafetyeducator.com, the Playing it Safe blog on Firehouse.com and Safety Talk Radio. Hilton, an IFSAC certified Public Fire and Life Safety Educator II and Firefighter II, serves on the Arkansas Fire Prevention Commission, is a deputy fire marshal for the State of Arkansas and serves on several national fire service committees. Hilton is an adjunct instructor for the Arkansas Fire Academy and a contract instructor for the National Fire Academy. She is the state educator contact for NFPA for the state of Arkansas, a member of the Home Safety Council's Expert Network and a Firehouse.com Contributing Editor. Hilton currently appears on PBS KIDS Sprout On Demand sharing fire safety tips with her Dalmatians Sparkles and Spanner and has appeared on FOX and Friends. All rights reserved by firesafetyeducator.com. No material on these pages may be archived, retransmitted, saved in a database, reproduced, or used without the expressed written consent of firesafetyeducator.com, 106 East Poplar Street, Suite 100, Clarksville, Arkansas 72830. 479-754-8652. Copyright 2008-2009.